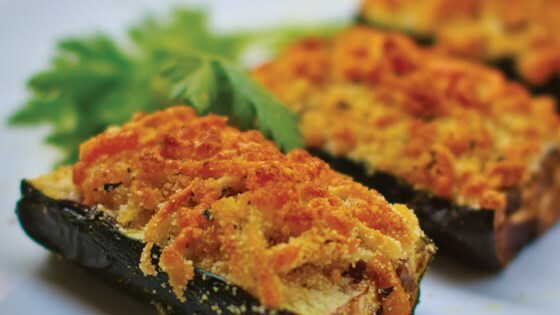 "Crispy and delicious, these zucchini slices are 'fried' in just one one tablespoon of oil, and then topped with a mixture of breadcrumbs, herbs, and cheese." Heat the Philips Airfryer to 180C. Slice the zucchini in half lengthways and cut each piece in half again through the middle. You'll end up with 8 pieces of zucchini. Place into the Philips Airfryer basket. Mix together the parsley, bread crumbs, cheese, oil and freshly ground black pepper to taste. Top the zucchini with the mixture. Slide the basket into the Airfryer and set the timer for 15 minutes. Fry the zucchini gratin until the timer rings and the gratin is golden brown.